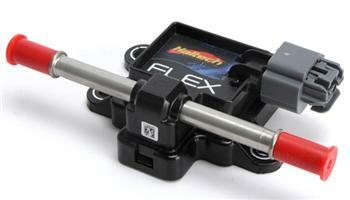 A Flex Fuel Sensor is a device that measures the ethanol content in the car’s fuel system. The sensor is installed between the fuel pressure regulator and the fuel tank, where it monitors the ethanol content of the fuel returning to the tank. That information is then passed onto the Haltech ECU which applies fuel, ignition and boost corrections to make the best power for the ethanol content available. The Haltech Flex Fuel Sensor allows the driver to add any mixture of ethanol/petrol (from 0-100% ethanol content) without the need to swap tunes or use a laptop. The Haltech Flex Fuel Sensor is easy to install, basic to setup and works with all Haltech Platinum Sport and Pro ECUs – Another example of Haltech making things easier for the tuners.